The SISE (Sensitive Information Sharing Environment) Working Group of the All Hazards Consortium (AHC) is working on a new integrated (e.g. government and industry working together) initiative aimed at organizing federal and research data and resources in support of security/ disaster response related decision making for industry and state/local government. This initiative is being organized by the Federation of Earth Science Information Partners (ESIP Federation), the Edison Electric Institute (EEI), and the Multi-State Fleet Response Working Group (FRWG) of the All Hazards Consortium (AHC). 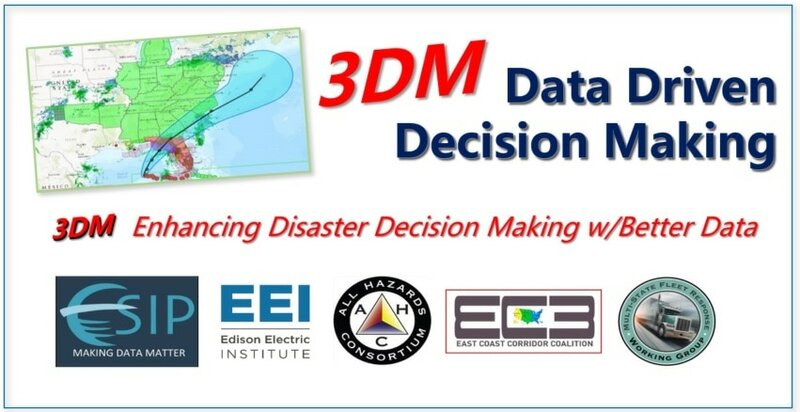 This will be the second 3DM (Data Driven Decision Making) Workshop designed to engage industry (electric, food, fuel & telecom) and government (local, state, federal) to identify federal agency and research organization data sets and technologies that can be used by states/locals and industry to enhance local/regional disaster related decision making, situational awareness, operational coordination and communications. This initiative seeks to identify specific datasets from federal agencies/labs and researchers that can address FRWG approved operational use cases that are important to disaster response efforts for a local, regional or national disaster of any type. An inaugural workshop was conducted in October 2016 in Washington D.C. that brought together federal, state and local government officials along with industry representatives from the electric, telecom, fuel and food sectors to discuss and agree upon the initial goals/objectives, timelines and approach to aligning data with real world use cases.